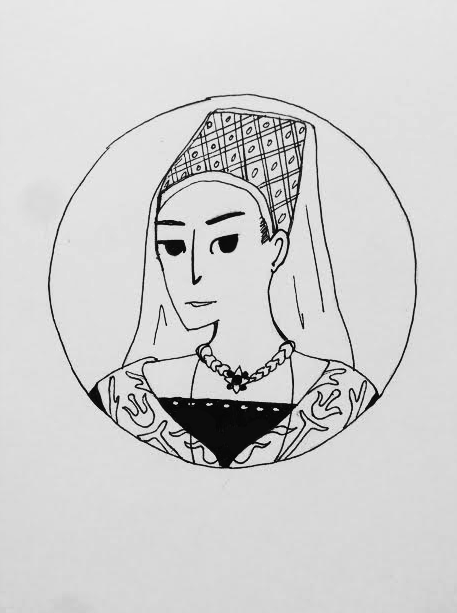 Elizabeth Woodville was a widowed mother of two boys when she caught the eye of Edward IV. The 22-year-old Edward had only been on the throne for three years and he was expected form an international alliance by marrying a European princess. Instead, Edward secretly married the daughter of a minor English noble and his Luxembourgian wife. This was only the second time since the Norman Conquest that an English king had married one of his subjects. Elizabeth’s family was greatly enriched by her position as queen, but the reign of Edward IV was far from secure and he lost the throne for six months in 1470-1471. During this period, Elizabeth was forced to seek sanctuary in Westminster Abbey where she eventually gave birth to her son Edward. When Edward IV died suddenly at age 40 in 1483, Elizabeth became the Dowager Queen and her twelve-year-old son Edward V ascended to the throne. But this was not to last. Three months later the tween king was declared illegitimate and deposed by his uncle Richard III. Edward V and his younger brother Richard were sent to the Tower of London and disappeared after 1483. Richard III executed Elizabeth’s second son by her first marriage and her brother in June 1483. Elizabeth and her surviving five daughters sought sanctuary in Westminster Abbey until March 1484. With her two sons by Edward IV presumed dead, Elizabeth allied herself with the Lancastrians. Elizabeth and Margaret Beaufort arranged a marriage for their children Elizabeth of York and Henry Tudor. This marriage would unite the House of York and the House of Lancaster under a single royal couple and put an end to the Wars of the Roses. In 1485, Henry Tudor defeated Richard III at the Battle of Bosworth Field and became last king of England to win his throne on the battlefield. He cemented his claim five months later by marrying Elizabeth of York. This was the beginning of the Tudor dynasty that would last until the death of Elizabeth I in 1603. In February 1487, Elizabeth Woodville retired to Bermondsey Abbey. She died in 1492 and is buried at Windsor Castle.